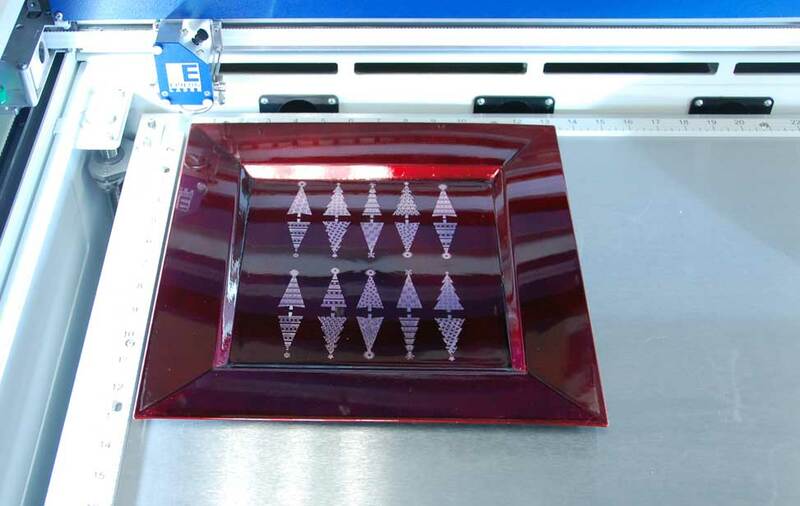 We found these great charger plates that can be custom engraved for Christmas. They are brightly colored with a silver film under the top color, which provides a great contrast when engraved with the laser. Charger plates bring and elegant and festive feel to any table. 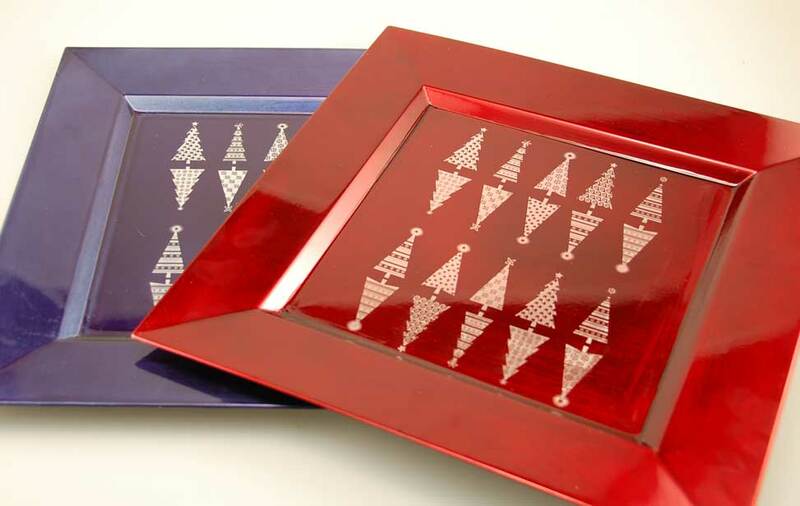 Regardless of the occasion, these engraveable plates add color and contrast to nearly any event. 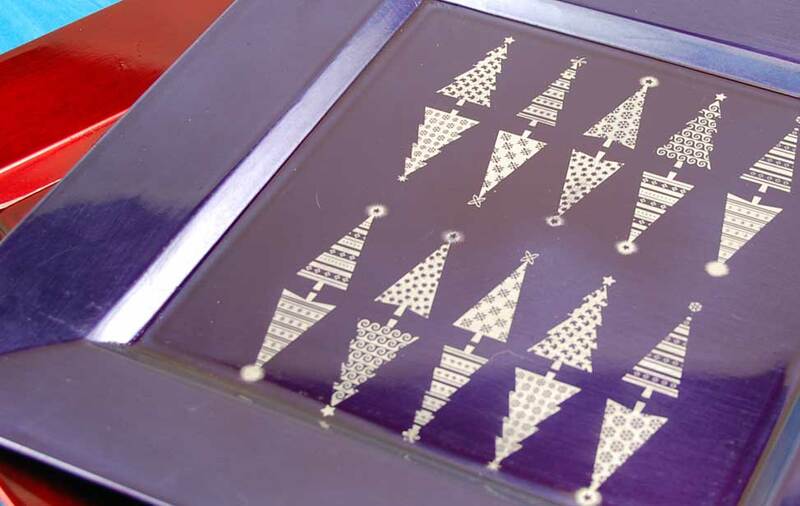 Here we'll walk you through the steps of creating these lovely holiday-themed chargers. Use your own ideas or designs to recreate these pieces for any season! Engraved blue and red chargers, created with an Epilog Laser. A close-up view of the engraving on a blue plate. Charger inside the laser table. Metallic Plastic Chargers - we purchased red and blue chargers from Bed, Bath & Beyond. If these are no longer available, check out other charger plates online and experiment for yourself! Next, insert the charger into the laser and move your home position to the left corner of the lower part of the plate. 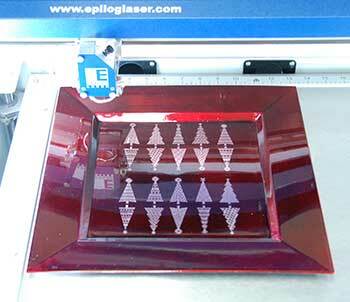 Draw a vector box around your design and run only that portion on the laser, with the red dot pointer turned on. This will help ensure your design is placed correctly. NOTE: Because each charger is a bit unique, manually focus your machine to the center of the plate to compensate for any slightly uneven areas. Send the job to the laser and you're all set! Before removing the charger from the machine, inspect it to see if the engraving is to your satisfaction. 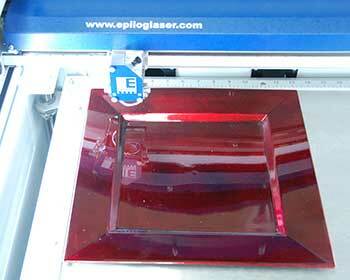 If you'd like to engrave more material away from the plate, run the job again at 100% speed and 15% power.